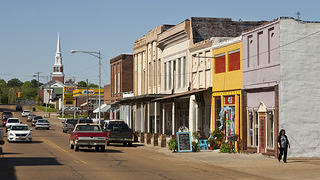 Thanks to its support for small businesses, welcoming attitude, and beautiful historic buildings, the former railroad town of Water Valley, Miss., is thriving. n the back of The B.T.C. Old-Fashioned Grocery, Coulter Fussell has her iPhone out. The 36-year-old gallery owner is showing it to Eddie Ray, the 71 year-old former president of the local bank. Together they form a singular pair: Ray, the retired banker, squinting at the Instagram feed of Fussell, the young artist. Both are buzzing with excitement, all over Fussell’s photos of two vintage signs hand-painted on the wall of a building across the street. The signs came to light just hours earlier during a renovation project. It’s exactly the type of thing that gets people going these days here in Water Valley, Miss. Thirteen doors north, 33-year-old Kagan Coughlin stands covered in sawdust, grinning at that very same building -- one of five neglected commercial structures, all dating from 1910 or before, that he purchased only eight days ago. This is par for the course lately in Water Valley, once a bustling repair facility and storage yard for the Illinois Central Railroad and now home to 3,392 people in the northern Mississippi hill country. It’s a place I grew up hearing about like it was some kind of promised land. My grandmother was born and raised here, and -- she was always quick to point out -- even won the title of Watermelon Queen one year at the annual Watermelon Carnival (which, as far as I can tell, makes me the Watermelon Prince). But although Water Valley loomed large in my own youthful imagination, it long remained a well-kept secret from the rest of the world. The town’s former rail depot harks back to its days as a hub for the Illinois Central Railroad. 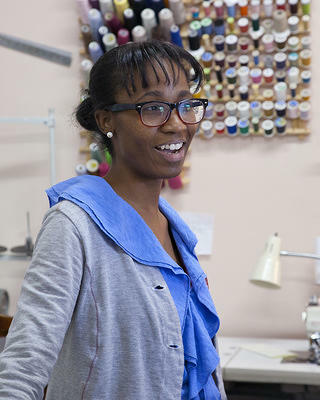 Twenty miles south of the region’s cultural nucleus of Oxford and the University of Mississippi, Water Valley has witnessed an influx of young families and entrepreneurs over the past few years. Pushed out of Oxford and other cities by rising prices, they’ve been drawn to Water Valley for its beautiful historic architecture, incredibly affordable real estate, and burgeoning cultural and arts scene. Main Street, which once was dotted with empty, careworn storefronts, has seen more than 19 new businesses open in the past five years alone. Coughlin, sawdust in his ear and a mask around his neck, serves as a prime example of today’s Water Valley entrepreneur. In 2007, after he and his wife, Alexe van Beuren, relocated here from Washington, D.C., they bought one of the largest buildings in town -- a 140-year-old, 10,000-square-foot brick structure -- and started renovations. At the time, the building was slated for demolition. Plenty of people questioned Coughlin and van Beuren’s sanity, but after three years of shoring up walls, stripping out inappropriate add-ons, and following historic preservation guidelines, they opened The B.T.C. Old- Fashioned Grocery. (The store is named, aptly, after the initials of the first three words in a quote attributed to Gandhi: "Be the change that you wish to see in the world.") Since then, the B.T.C. has sold local produce, made the best sandwiches in a 30-mile radius, been featured in The New York Times and The Wall Street Journal, and become a social and gastronomical hub for the town. In other words, it has become the change. There’s even a new B.T.C. cookbook, authored by van Beuren and local chef Dixie Grimes. Now Coughlin smiles at the signs Fussell and Ray were cooing over in the B.T.C. building: chipped paint on an old brick facade advertising “Easy Terms” and “Dinettes” from a time when Water Valley was a boom town. And, sure, that time is long gone, but today Main Street feels like it might be part of a brand new boom. Mickey Howley outside Bozarts, the Main Street art gallery he founded with his wife, Annette Trefzer. One block down from Bozarts, artists Coulter Fussell and Megan Kingery Patton run a gallery called Yalo Studio. Artist Bill Warren painted the signs for both galleries, as well as the B.T.C. Howley moved to Water Valley in 2002 with his wife, Annette Trefzer, an English professor at the University of Mississippi. The couple bought a 96-year-old, 2,500-square-foot home for $80,000. “It was a no-brainer,” Howley says. Within a few years they had purchased a second local relic: an 1880 storefront on Main Street for $60,000. After three years of off-and-on renovation, they opened an art gallery in the space and cheekily named it Bozarts Gallery (after H.L. Mencken’s 1920 essay “The Sahara of the Bozart,” an indictment of arts in the South). Howley sees much of Water Valley’s promise in the very structures built here more than a century ago. “Everything we need is already here,” he says, citing a robust infrastructure and a handful of core businesses that, even during slow times, never moved off Main Street. Turnage Drug Store, a 109-year-old purveyor of milkshakes and prescriptions, is in its fourth generation of family ownership; the North Mississippi Herald, a small-town paper if ever there were one, first started printing in 1888; and Mechanics Bank, founded in 1892, is flanked by dozens of establishments it directly helped to finance. “We couldn’t have done what we’ve done here without those anchor businesses that make the town livable,” Howley says. In the wake of the railroad announcing its departure in the late 1920s, the drugstore, newspaper, bank, and others managed to stay afloat because Water Valley’s population and economy, though much diminished, avoided complete collapse. The town relied in part on agriculture, throwing its first Watermelon Carnival in 1931 as part of a plan to brand Water Valley watermelons. More important, local leaders also wooed a handful of manufacturing plants to town. One is still in operation, making cutting-edge transmission components for BorgWarner, an international automotive parts supplier. Water Valley has deliberately resisted the all-too familiar deterioration of small-town commerce and its progression toward malls and big-box stores out on the highway. “What [many places] don’t realize is that that’s what’s killing them and making their towns indistinguishable,” Howley says. 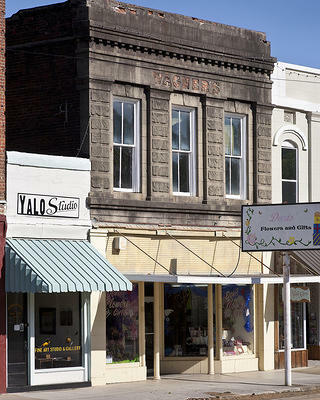 “That’s the last thing in the world we want.”Built on the meander plain of Town Creek, which runs to the Yocona (pronounced YOK-na) River, Main Street truly is the lifeline of Water Valley. 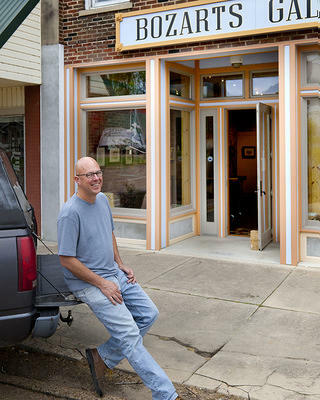 Nineteen storefronts feature hand-painted signs, almost all created by Bill Warren, an artist who relocated to Water Valley from New Orleans in 2008 (and won a 2012 citation for Best New Signage by the Mississippi Main Street Association). 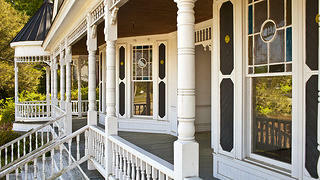 Water Valley’s primary residential blocks cluster closely around Main Street, with eye-pleasing houses built between the 1870s and the 1920s in varying architectural styles. Fashion designer Julia Ray works out of a studio in The B.T.C. Old- Fashioned Grocery building. Take, for example, Fussell and her friend Megan Kingery Patton, both 36-year-old artists who had been priced out of Oxford and found homes in Water Valley. Together they started looking for a space to make their own art when they found a tiny barbershop with a 10-foot-wide storefront, built on Main Street in 1910. “First we said, ‘Let’s show our own work here,’” Fussell recalls. “Then we said, ‘Let’s show our friends’ work!’” By 2011 they’d transformed the barbershop into their gallery, Yalo Studio. “Now that’s where we keep the white wine during openings,” Fussell says, pointing at an old shampoo sink still jutting out of the wall. Coordinating many of its exhibition openings with Bozarts, Yalo capitalizes on an engaged local population, as well as out-of-town art lovers. On opening weekends, the galleries get so packed you can barely walk in the door, and traffic comes in digitally, too. After a recent exhibition opened, Yalo sold 46 paintings in 48 hours through its website alone. Andy O’Bryan (left) and Amos Harvey at O’Bryan’s Yalobusha Brewing Company, located in a 153-yearold building. 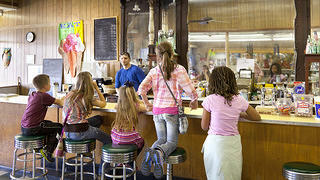 The popular soda fountain in Turnage Drug Store. A view of Water Valley’s Main Street. The town’s quirky, fairy-tale architecture adds to its charm. Longtime Water Valley dwellers and Oxford transplants aren’t the only ones calling the town home these days. In an airy apartment above the B.T.C., where the ceilings rise 20 feet and light floods in through enormous industrial-style windows, photographers Carolyn Drake and Andres Gonzalez lounge on a sofa. This apartment, part of Coughlin and van Beuren’s first renovation project, is a new home base for Drake and Gonzalez, who recently moved here from -- of all places -- Istanbul. Their work has appeared in the pages of The New Yorker and The New York Times; Drake has been a Guggenheim Fellow, Gonzalez a Fulbright Scholar. 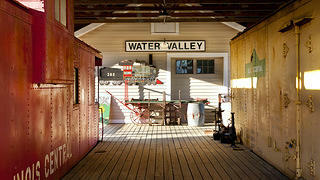 Together they embody the type of international creative professionals who have increasingly been drawn to Water Valley. A draw for visitors and locals alike is the growing selection of excellent cuisine in Water Valley, which was recently named one of America’s “Best Little Food Towns” by Food & Wine magazine. One newly opened restaurant, Crawdad Hole Jr., is housed in a 1920s AC Delco service station. The gas pumps still stand out front, and uniforms still hang on pegs inside, but today this place serves up some of the finest seafood in northern Mississippi. “I’m sure no one ever thought I’d be cooking seafood in a service station!” co-owner Justin Showah shouts, setting a vat of shrimp over an open flame. 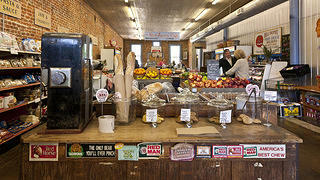 Fresh produce shares space with baked goods inside The B.T.C. Old-Fashioned Grocery. 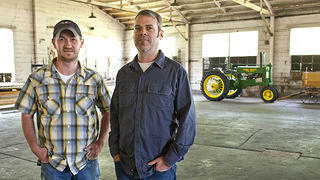 Stories like this -- about the ease of founding a business in Water Valley -- abound. Another startup in town, and perhaps the most surprising one, is Yalobusha Brewing Company (named after the county in which Water Valley sits). Because the town only lifted its longtime prohibition of beer in 2007, it still comes as a shock to many residents that 33-year-old Andy O’Bryan has opened a full-scale brewery here in a 153-year-old foundry on Main Street. Water Valley’s beer-free past hasn’t dampened support for his efforts, though. “People come up to me in the grocery store and say, ‘You know, I don’t drink beer, but I’m so glad you guys are in that building and doing something with it,’” O’Bryan says. Not only was the former foundry perfect for O’Bryan’s needs, it also cost considerably less than what he might have spent in Oxford, where available spaces were scarce. Despite all of Water Valley’s historic buildings, low prices, and cultural riches, though, sometimes its allure lies in things ever more basic. Back on Main Street, after Coughlin walks me through his freshly gutted buildings, I ask him why he chose to move here in the first place. He doesn’t miss a beat. “We stopped in at the drugstore,” he says. “We met Binnie Turnage, and he made us a milkshake.” He shrugs, as if the rest is obvious. As Watermelon Prince of this kingdom, I might be partial to Water Valley, but royalty or not, there’s no shortage of reasons to fall in love with the place. Milkshakes are only the start. See more photos and read the full issue in our digital edition of Preservation. 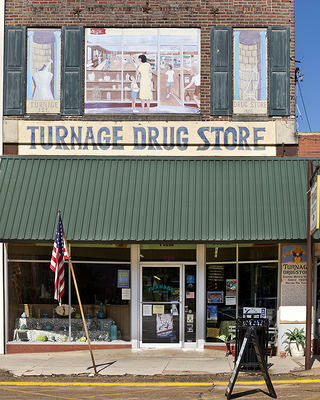 Turnage Drug Store is a 109-year-old, familyowned institution. Nic Brown is a Colorado-based novelist who has written for The New York Times and Garden & Gun, among other publications. This is his first story for Preservation.